Happy Summer, Children's House Families! We cannot believe how quickly this year passed. We deeply encourage you to re-visit and re-read past blog posts. This is a way to begin to digest the processes of the child as they develop sequence and independence. Furthermore, you can witness the development of concentration which is the fundamental preface to complex understanding and logic. 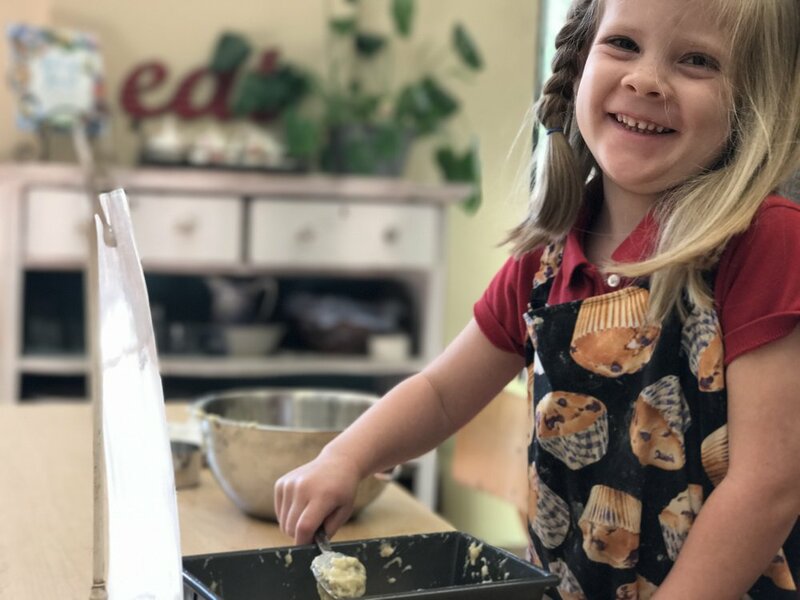 Dr. Montessori observed that the children who develop this ability are immensely happy. 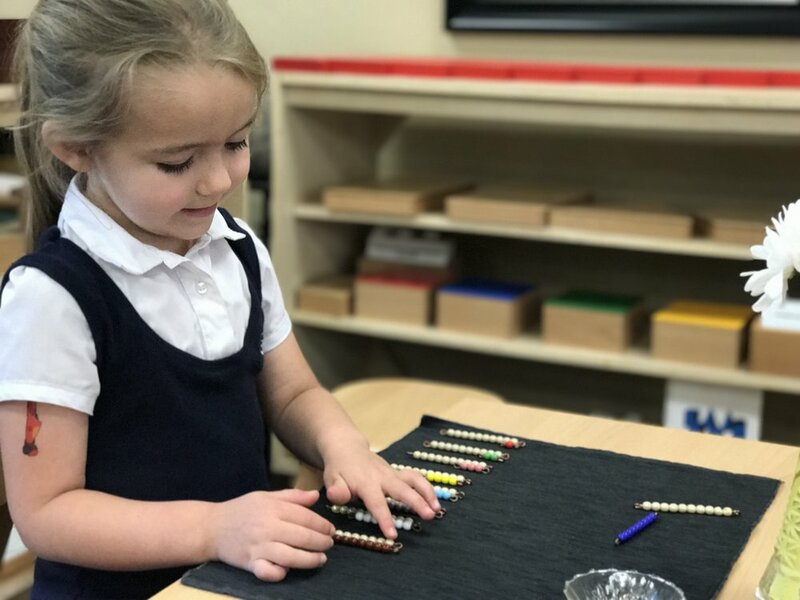 Concentration is the bedrock of Montessori Education. This is something that a Montessori guide observes day after day. Given the opportunity to explore and expand his interest the child's experience is almost euphoric. Concentration and joyful engagement is a solid foundation of mind-body integration supporting the nervous system. With this principle in mind, we find it crucial to revisit the difference between concentration and stimulation before we dive into summer. Your child has likely developed the ability to joyfully engage and concentrate with intent, deliberation and control. The correlation between the Montessori environment and home is pivotal. It is important to keep in mind that the brain is in constant dance with the environment. The qualities of the environment (beauty, order, reality, simplicity and accessibility) lead to self-effort and consciousness. Movement is an important part as is promotion of cognitive development and self-control. 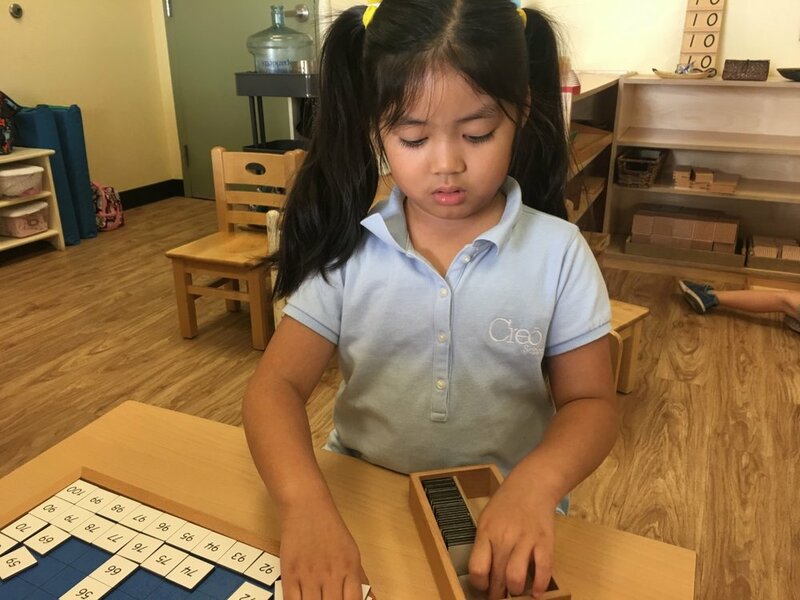 Joyful engagement and concentration is DIFFERENT than stimulation which promotes work from the child for iPad and screen time. Technology offers the child the wrong time of stimulation during this period in development. It does not promote respect as eye contact and human interaction is missing. Less stimulation causes more reality, which allows more clarity. So, let's get outside (or to the museum) and have a commercial free summer! Concentrating on the essential combinations of multiplication through concrete exploration. 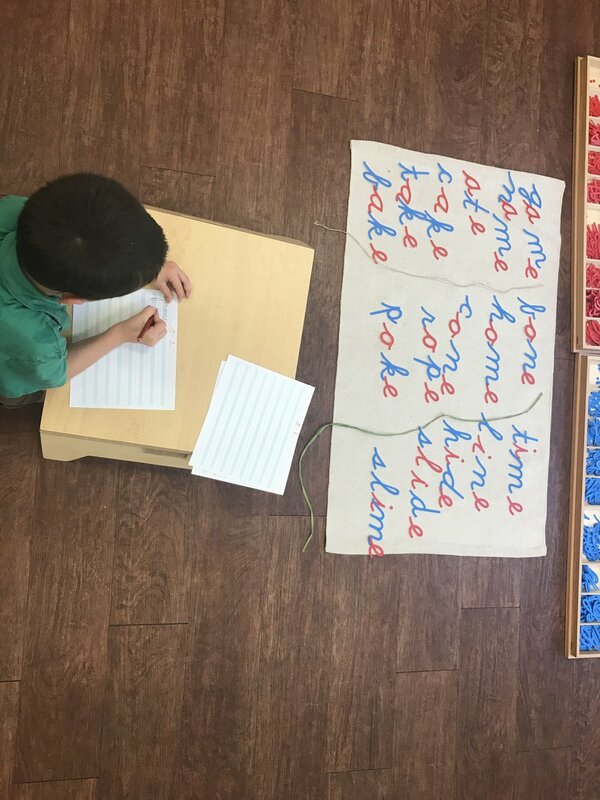 The child uses comparative phonograms to practice spelling with silent e's. Making strawberry lemonade to serve to observers! Practical life exercises are “chores” adults may do to maintain their home environment. 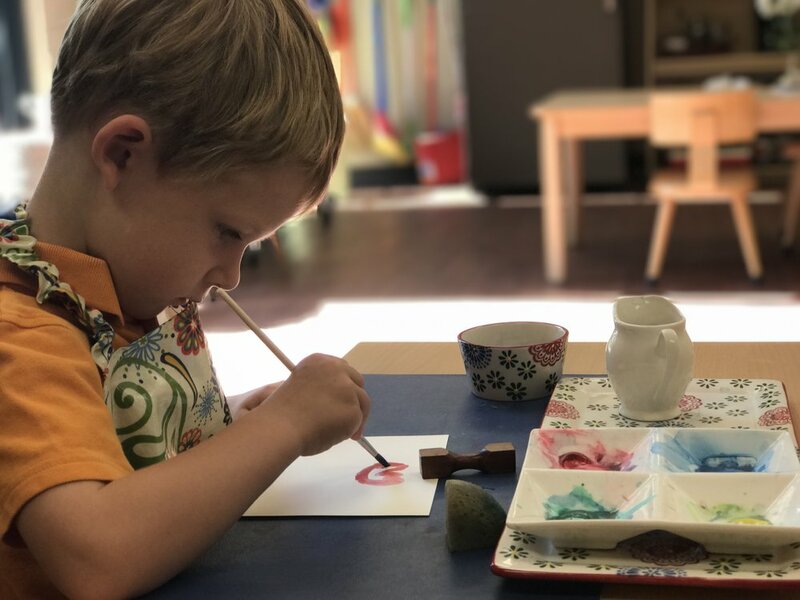 However, for the first plane child, these activities are an exercise in turning chaos into order, self-perfection, concentration, and self-confidence. The young child loves to imitate mom or dad working around the house. 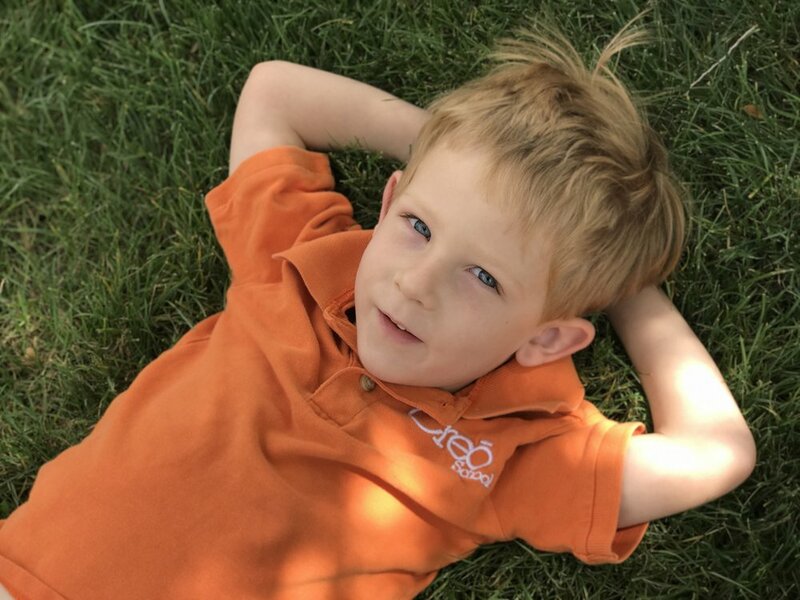 The summer months are a great time to add some items to your environment to help the child “help himself” and set up a routine where your child can help throughout the year around the home. Please keep in mind, that a child thrives on order, consistency, a place for everything, and visually appealing work spaces. Items to include in the home should be child-size, easily accessible, and at the child’s height. Plates, cups, utensils, pitchers, etc. Include your child when setting up the above mentioned items. Take it slow. Allow yourself plenty of time to work with your child on an activity. Add one activity at a time. Show the child how to do the activity in a slow precise manner; where to find the items needed; and how to replace the items. Give the child time and space to do daily activities. Allow the child time to internalize a job well done. When they look to you for approval, give a warm acknowledging smile and ask how they feel about the work they just completed. Children enjoy being productive and helping out. This is a great age to guide your children to skills they will need for a life time. Concentration is needed for this activity. This is one of the greatest opportunities to expose the children to one of a kind masterpieces of the artists Frida and Diego at the Heard Museum. · The mysterious Addams family is coming to Scottsdale. A musical, playing at Desert Stages Theatre through Sunday, November 1. · Exhibiting art works from baseball, tennis and ballet to bullfighting from 19th- 20th century. It is a combination of Asian, European and American art. · Taking place at the Butterfly Wonderland, the children can enjoy a guided tour at the conservatory. · Performed by Ballet Arizona, a dance in the desert combines movement, sound and multimedia on a stage that holds the desert as a background. Thank you for an outstanding year full of growth and memories. The children developed stronger personalities, academic skill-sets and friendships as each day passed. They are truly a remarkable group of children and it has been an honor to serve them this year. We encourage you to allow your child to have many opportunities to play with school friends this summer. We are extremely proud of the children who are 'Flying Up' to Elementary this week. It has been an honor to watch these children flourish over the three years they have been with us. Congratulations! Best wishes for a relaxing summer break! We are eager to see your bright smiling faces return in August. The child develops concentration and refinement of movement. This is also indirect preparation for writing as it strengthens the first three fingers of the hand. 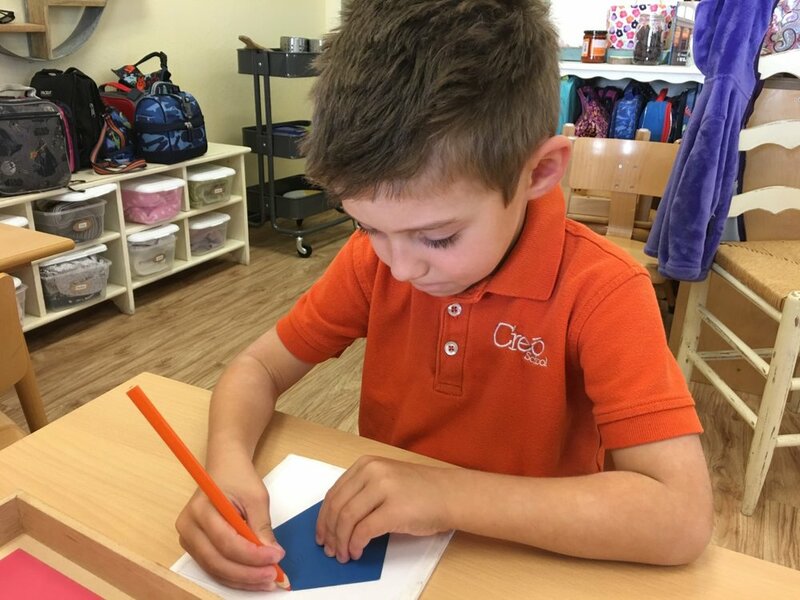 A child looks forward to a weekend activity and expresses his excitement through writing. The child bakes banana bread for observers. Imagine if all adults continued to model the same type of compassion towards each other that is so innate in childhood. The child expresses herself through painting on the large easel. This is a preliminary exercise for flower arranging and other activities that require using a funnel. The child also learns to measure and concentrate with this material. This multi-step practical life activity allows the child to follow a sequence in order to wash her hands. 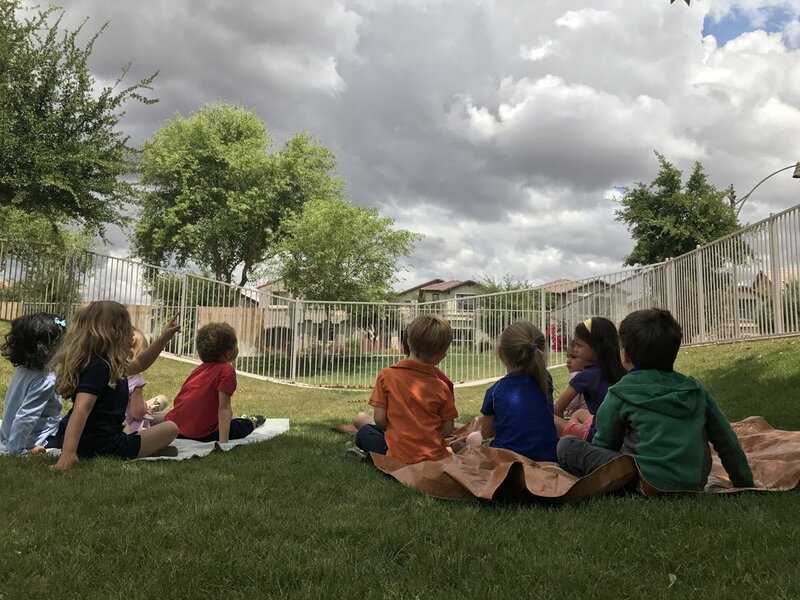 The children learn the names of types of clouds while using their imagination to observe. The child relaxes while watching the clouds take different shapes on an overcast day. The child learns that teen numbers are composed with a number base of 10. As the school year has come to an end, I would like to take a moment and thanks all the Creo parents. As part of the Creo Community, we have tried our best to serve the children in a positive happy environment to fulfill their potentials. We truly have enjoyed all the hugs and smiles your children have shared with us throughout the year. The children are greatly excited for their peers who are flying up to Elementary next year and were glad to celebrate their Flying Up ceremony with them. 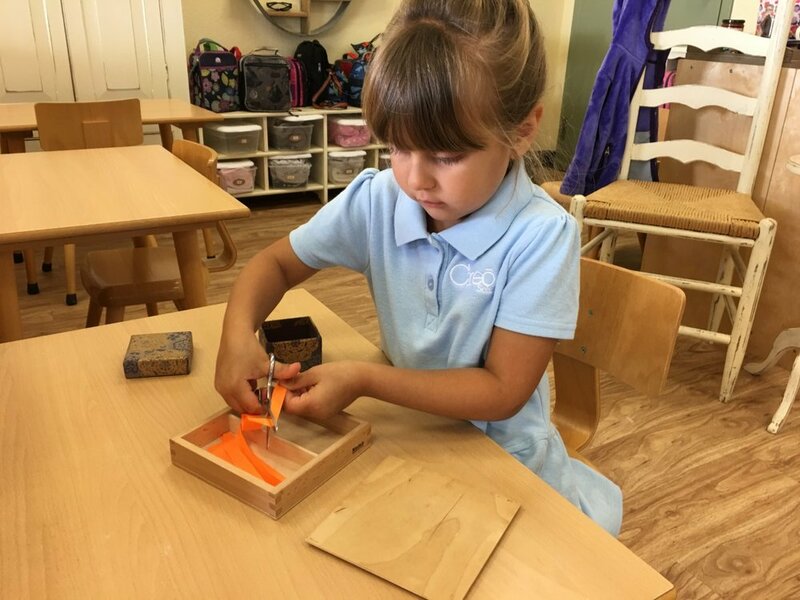 Along with the daily materials, the children got to work on their "Mother's Day" gift and were thrilled to learn that they are going to plant seeds with their Moms. We hope we could help them to express how much you mean to them and how precious these little experiences are in life. At last, thank you for supporting all our efforts in providing an authentic Montessori education to your children. We couldn't ask for a better group of students. They are amazing and we were very fortunate to be part of their lives. Development of aesthetic sense of the child. Giving the child the opportunity to write cursive! To familiarize the child with the different ways of numbers may be divided. Study of coins from different countries. Taking a leadership role by helping a younger friend. Developing hand muscles. Indirect preparation for writing. Serving the office staff with freshly baked Banana Muffins. Indirect preparation for mathematics: the cube of a binomial. Exposing the child to different art techniques. With this being our last post of the year, I would like to share my warmest thanks to all the parents who entrust your little one to us. We are so grateful to have them in our lives. Each day we are touched by their growth, loving spirits, and innocent view of life. They refresh our faith in mankind. Have a peaceful and restful summer and we will be here with open arms to welcome all the children.